Yellow Pages Goes Green has a great site with info and the ability to opt out of receiving a phone book. Very cool. Ever tire of being a mere surface dweller? Mike Oehler, one of the worlds foremost underground house designers, shows you how to harmonize with your environment on a budget. 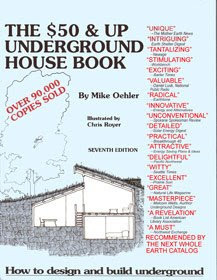 While subterranean dwelling may not be for everyone, it’s a fun read and has an abundance of surprisingly insightful ideas. Available at Undergroundhousing.com and your local library (if it's eclectic that is). Yes, that Dr. Suess. The Lorax is probably one of the best books ever written on the problems of conspicuous consumption and how it affects our planet. Kids love it, parents love it, and most importantly, it’s a simple way to begin a dialogue about the environment with children. From the Grickle-grass to the Brown Bar-ba-loots to the problems with Thneeds (which everyone needs), the Lorax is a book for all humanity. Available at your local library and Amazon.com. This is pretty cool. Treewala has a vocabulary game that will help the planet. For every word you get correct you get a leaf on a virtual tree of sorts and each leaf generates ad revenue. That money is then taken and used to plant sustainable forests in areas of the rain forest that have been destroyed. How cool is that? So what do you say, want to learn a thing or two and save the rainforests? Kind of a cool website I learned about a few weeks back as they interviewed me for their podcast. They've got some really good info. Check it out. Run your car on Java? Hmmmm, I wonder if caf gets better mileage than decaf. Check out the buzz (pun intended) from The Economist. Run your business on Veggie OIl? And you thought veggie power was just for the road. Check out the Vegawatt and use that unwanted fryer oil to run your business! Here's a great opportunity to study the North Pacific Gyre firsthand. Check out this site for info on how teachers of all experience levels can actively participate in a ten day study of the garbage patch. Real world hands on experience combined with daily write ups on their blog and a recap afterwards will provide valuable information about this problem to kids around the world. This story is not so much about Ford, as the title might make you think, it's actually about the Canadian company, Magna International. Magna is a tier one supplier, a company that isn't known as a car manufacturer, but makes and supplies many of the crucial components of the cars that the big OEMs assemble into their cars. In this case, Ford wanted a battery EV, and instead of engineering it from scratch, Magna did it for them and used the Ford Focus as the demo model. What's interesting is that Magna can sell this same generic EV to any car maker with a model of similar size to the Focus. There's significant savings in doing it this way so it should allow other car makers the option of bringing a low cost BEV to market within the next 3-4 years. Magna is even designing its own body for the EV in case a car company doesn't even want to do that part. Seems to me, this makes them a car maker like all the big OEMs. I wish they discussed the battery some. No info on the kWh capacity, although they do claim a 100 mile range which indicates around 25 kWh. Ford saved big money by partnering with parts supplier Magna to develop its competitor to the Chevy Volt. 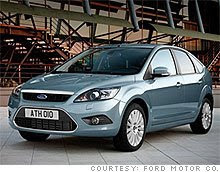 The electric Ford Focus, due out in 2011, will be based on the the next-generation Ford Focus. It wll resemble the European version of the car, shown here. NEW YORK (CNNMoney.com) -- Ford is preparing to sell an electric car developed almost entirely by an outside supplier. While that may cut down on bragging rights - General Motors created the Chevy Volt in-house - Ford says it also cut down on costs and risk. In other words, why invent the electric wheel when somebody else can do it for you? Meanwhile, Ford's partner, auto supplier Magna International, is offering to do for other carmakers what it's done for Ford, and possibly more. If you're a carmaker and you want to sell an electric car, Magna says it's ready to design it and build it for you. The electric Ford Focus, due out in early 2011, is largely the product of Canada-based auto parts and assembly supplier Magna International (MGA). Magna developed the car mostly on its own, building it inside a Ford Focus body for demonstration purposes. Unlike the Volt, Ford's electric Focus will not be a "range extended car." In other words, it won't have an on-board gasoline-powered generator to pump out more electricity for longer drives. The Focus will not burn gasoline and will go about 100 miles on a charge. Before hitting the road again, drivers will have to wait to recharge. Meanwhile, the Volt will only go 40 miles before needing to burn gasoline - still farther than most people drive in a typical day, GM says - but it will have a 300 mile total range. In August, 2008, Magna presented its electric car to Ford engineers and executives. "We took a look at that execution and said, 'Hey, together we can really make this a proposition," said Nancy Gioia, Ford's Director of Sustainable Mobility. Five months later, in January, 2009, Ford (F, Fortune 500) announced its intention to produce the car at the Detroit Auto Show. Ford had been discussing electric vehicle requirements, in general, with Magna for more than two years, Gioia said, but that was the first time anyone outside of Magna had seen the car. It was after the August meeting that Ford became seriously involved in the project, providing details and feedback to help make the car feasible for production and to make sure it was the sort of car Ford wanted to sell. Magna, a wide-ranging auto industry supplier - it even has a European subsidiary, Magna Steyr, that builds vehicles for BMW, Mercedes-Benz, GM and Chrysler in an Austrian factory - has expressed interest before in designing, engineering and building an entire car. In this case, Magna founder and chairman Frank Stronach asked his engineers to develop an electric car that could be sold under any brand by any carmaker, said Ted Robertson, Magna's chief technical officer for the Americas. "It's a generic system we were designing so it could be put into anybody's vehicle," Robertson said. The Focus wasn't chosen because Magna wanted Ford as a customer, Robertson insisted. It was chosen simply because it was the right size, it was light and its design - particularly the suspension design - allowed engineers to experiment with different layouts for the car's electric drive systems. "We needed to develop the parts not only in the computer, but we needed to build a vehicle to do a proof of concept," he said. The car drives just like a gasoline-powered Focus, said Bill Pochiluk, an industry analyst with Automotive Compass. The electric Focus's 100-mile range will do just fine most of the time. "This vehicles makes you wonder: why do we need the Volt?" said Pochiluk. Ford could have developed an electric car on their own, but Magna's work allowed the carmaker to bypass a lot of expensive engineering and development work, Pochiluk said. "This certainly leapfrogged a lot of what Ford had been thinking," he said. Ford, in fact, would have developed some sort of an electric car on its own had Magna not come forward, Gioia said. The electric Focus will go on sale in early 2011 and it will be based on the next-generation Ford Focus small car. By then, it should be Ford's second electric vehicle. The first will be a small electric work van that's scheduled to go on sale next year. Ford also partnered with an outside supplier, Britain's Smith Electric vehicles, to make the van. Magna's agreement with Ford isn't exclusive. Magna plans to sell the system to other carmakers besides Ford and, said Gioia, Ford has no problem with that. "In fact, we encourage it," she said. "We want Magna to be successful." For Ford, the strategy is similar to the approach taken with the carmakers' popular Sync in-car entertainment system. That system, which Ford credits with boosting sales of its current Focus compact car, was developed in partnership with Microsoft and the software giant retains the right to sell it to other automakers. If Ford had insisted on exclusive rights to use these systems, Microsoft and Magna would have had to charge much higher fees to cover their costs. That would have erased the financial benefit of having an outside company develop the systems. In this case, Magna is even developing its own car body in case a a customer doesn't have one to use. And Magna can even produce the car in its factory, if a carmaker wants, said Robertson. "If a car company doesn't have an electric vehicle and they want one," he said, "we'd be happy to do one for them." If you haven't heard of this, check it out. EcoFont is a printer font designed to use less ink but still look good. My friend Drew passed this along and it's pretty cool. It may not make a huge difference if you are like me and rarely print, but imagine institutions that print volumes? Every once in a while my friend Paul Scott, founding member of Plug In America, EV advocate and Solar guru, sends me an email about something going on in the world of solar or EVs. I will be posting them here under the heading According To Paul pretty much as in the same state he sends them to me. Also, over the next week or so i will be bringing stuff form the other site over here so my apologies if there are a lot of posts. Darell is one of the more active members of Plug In America and has the best EV site anywhere (www.evnut.com). He was allowed to put a new Mitsubishi iMiEV (pronounced "imeev") through its paces and wrote a great report on his experience. 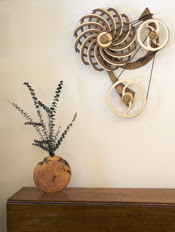 I copied part of it below, but for all the photos and more info, go to http://evnut.com/iMiEV.html. My only comment was his note about coasting. This is something all EV makers will want to incorporate in their cars. If you've never driven an EV, you might not know about the "freewheeling" aspect of coasting without the regenerative braking. 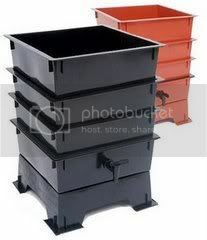 This allows for superior efficiency if used properly. 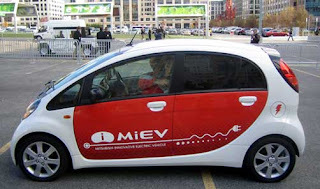 Both the Nissan of yesterday's post, and this iMiEV from Mitsubishi do not allow this option. I told the Nissan folks they should definitely build it in as it's easy to do and will be a competitive advantage over those who don't have it. Check out Darell's site, lots of good info and funny in places. March 19, 2009. Vacaville, CA. Today I got to drive a Japan-spec Mitsubishi iMiEV. And while this thing may look like a low-speed NEV, it most definitely is not. This car has a governed top speed of 81 mph, and a range of 76 miles. It seats four full-size adult males comfortably, and accelerates and handles smartly with that load on board. There is precious little cargo space - but as a people mover, I just can't see doing it any more efficiently. This is the ultimate commute vehicle. With the wheels placed at the extreme outboard edges of the vehicle, the passenger compartment is maximized (as well as handling and road feel). And what looks like a diminutive car on the outside suddenly becomes a comfortable pod for four adults on the inside. I had tons of headroom left over, and plenty of leg/hip/shoulder room all around. The car has all the normal amenities of power windows/mirrors/steering/brakes along with HVAC and stereo. The throttle and braking regeneration is seamlessly blended. This is a REAL car, folks, once you get over the outside dimensions. It has enough power to do anything that you need a freeway-capable car to do. With four large guys onboard, I was somewhat astonished at the acceleration. This is no Tesla Roadster, but it pulls away with every bit as much authority as the Rav4EV. When I think about carpooling in a vehicle like this, I almost get giddy. Shuttling a few guys to work in this instead of a solo driver in a Prius? Just no contest. The faults I can find include a charge rate (from 120 V or 240 V) of just 9A. I see little reason for this low limit. The other issue I have is that there is no way to "coast." 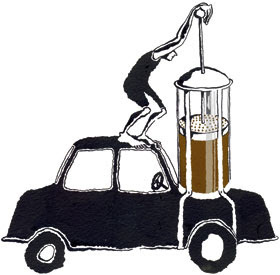 There is always some regen to mimic a gasoline car in compression. You can add a bit more regen with the shift lever, but there is no way to defeat it. To me this is an easy-to-rectify omission. The reasoning I was given is that they want the car to feel just like any other car. And that's fine! Just allow those of us who wish to have no regen a way to turn it off. A little button on the shift lever comes to mind! Dean Kamen is one of the cooler guys out there. The inventor of the Segway (and the wheelchair that walks up stairs that preceded it), he's one of the good guys who is working on fixing the problems the world has. So an article about Kamen, his island home, and his experiment to turn it 100% L.E.D. has got to be cool. Check it out!